bride.ca | $100,000 Wedding Party for a lucky Ontario couple? $100,000 Wedding Party for a lucky Ontario couple? The Carlsberg "Big Wedding Bash"
Just enter to win, on their bigweddingbash.ca, tell your friends to vote for you and cross your fingers. will even include "an exclusive performance from one of the hottest bands in indie music"
Your wedding will be attended by 1,000 of your closest friends, family and wedding crashers. In other words, if you don't mind Carslberg inviting a few (screened?) happy crashers to your wedding, go ahead an enter! will win a blowout wedding worth more than $100,000. (TORONTO, ON) – July 26, 2010 – Couples thinking about saying 'I Do' can win the chance to tie the knot at the Carlsberg Big Wedding Bash - an all-expenses paid extravaganza that will surely be probably the best wedding celebration. Starting July 26, couples from Ontario can enter themselves into the Carlsberg Big Wedding Bash contest online at www.bigweddingbash.ca. "We wanted to create an integrated campaign designed to not only enhance awareness of Carlsberg as an import brand but more importantly stimulate trial and truly engage and reward our consumers," said Becky Kwaitkowski, Brand Manager – Carlsberg Canada. "Carlsberg's talent for providing extraordinary experiences is going to make the Carlsberg Big Wedding Bash an event to remember". Carlsberg will give the winning couple an unforgettable Carlsberg-style wedding for 1,000 of their closest friends, family, and wedding crashers. The bash comes complete with an exclusive performance from one of the hottest bands in indie music and is set to be held at the Capitol Theatre in Toronto on October 1, 2010. Three finalist couples will be selected in August based on a combination of popular vote and various judging criteria including the originality and creativity of the couple's entry. Finalists garnering the most votes on www.bigweddingbash.ca between August 24 to August 31 through the creative use of social media including Facebook and Twitter will win the Grand Prize which includes the wedding along with Toronto FC tickets complete with his/hers Toronto FC jerseys. Valued at more than $100,000, the Carlsberg Big Wedding Bash will include Carlsberg bachelor and bachelorette parties, invitations, a paid for event venue, a photographer, a live headliner band, wedding rings, dresses, tuxedos and Chuck Taylors courtesy of Converse for the bride, groom and wedding party, flowers, food and of course – Carlsberg for all. To add to the excitement, Carlsberg will also hand out wedding invitations at a Toronto FC (Toronto Football Club) game on August 7th and at bachelor and bachelorette parties throughout the GTA, granting Carlsberg guests and soccer fans front-of-the-line access to the October 1st wedding, for those wanting to be real wedding crashers. 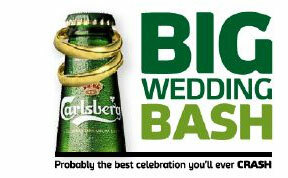 The Carlsberg Big Wedding Bash contest is open to Ontario residents of legal drinking age from July 26, 2010 – August 31, 2010. The winning couple will be announced on September 1, 2010. Secondary prizing sponsored by Sony Playstation and Callaway will be awarded to the two runner-up couples. For complete contest rules and regulations and details on official Carlsberg Big Wedding Bash events, visit www.bigweddingbash.ca. Carlsberg was founded in 1847 by the visionary brewer J.C. Jacobsen. Jacobsen demanded quality above all else and his innovations in the art of making beer laid the cornerstone of the modern brewing industry. Greatest of all innovations was the groundbreaking method for propagating pure yeast. The yeast, aptly named "Saccharomyces Carlsbergensis" was so extraordinary that Carlsberg gave it away to other brewers for free. To this day, whenever and wherever you enjoy a lager, there's probably a little Carlsberg in it. Today Carlsberg is the 4th largest brewery in the world, employing more than 40,000 people worldwide. Carlsberg Beer is the flagship in the Carlsberg Group portfolio, which consists of more than 500 different beers worldwide, from leading national beers to internationally recognized brands. Available in more than 150 markets across the globe, Carlsberg is a truly international pilsner of exceptional taste and quality.